This post is a bit rambling, but what the hey, it's my blog. 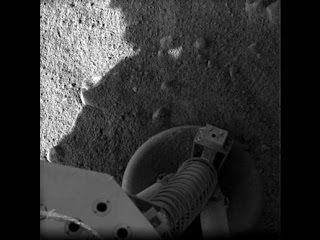 I love space exploration, so it shouldn't come as a surprise that I watched the touchdown of the Phoenix lander on Mars this afternoon. 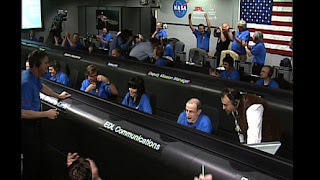 Although, obviously, it wasn't the landing itself that was on TV - it was Mission Control watching the data come in. And as I was watching, I was really struck by their outfits. 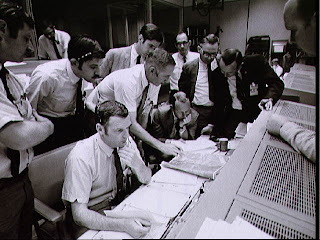 View of Mission Control Center during the Apollo 13 oxygen cell failure. While there are women's clothing options that are the equivalent of the suit and tie, they women would still appear different than the men in the room. I think there is something to be said for being able to blend in with the rest of your team. Same goes for the Discovery crew: black oxfords with khakis. I think the older Mission Control wear (white shirt, optional dark jacket) could have been replicated by a woman--except for the tie. I think the lack of a tie is the entire reason that the less formal clothes today are more innately gender-neutral. It's pretty interesting what a strong statement of gender one small item of apparel can make. As much as I believe that the clothing shouldn't affect the job, or stop you from doing it, I think the costumes have shown improvement, and I agree with the lack of a tie. but perhaps it wasn't neccesarily a requirement, it was a more a thing just tacitly picked by the male majority, and an application of their fore-knowledge. that being said, once women, or another "minority" joins, the work-team should and will gradually apply. so, maybe if more women more scientists, there would be more something special in for them. but isn't it giving sort of a bad name for women saying they only care about their clothing? so, if they've taken the path as what they want is a scientist, or what not, they understand that? either way, i feel there is a comfortable workforce for them in most places now. Perhaps they could have enhanced the mystique and exclusivity of Mission Control by designing some sort of gender-neutral jumpsuit/coverall with indecipherable codes, colorful sewn-on patches, and official-looking ID badges—something not quite as fancy as the astronauts themselves get, but something similar to enhance the team aspect. Then again, given the way costs get inflated for government projects, these would probably have ended up costing the equivalent of two space shuttles and a jar of Tang, so maybe...jeans and T-shirts that said "Mars or Bust!" Cool site, by the way. anon: yes, I think the tie does make a big difference. rachel: I didn't mean to suggest that the women only care about clothing. I suspect that the engineers in mission control - male or female - are happy not to have to worry about what to wear. But I think having more gender-neutral clothes makes women "fit in" better with the team, at least in that superficial way. Max: They are probably happy that they got the special shirts. NASA could probably make a bunch of extra $$ by designing a cool mission t-shirt, then selling to to the public. ed: glad you find it interesting. I think it would be great if NASA had better funding - or at least more regular funding.